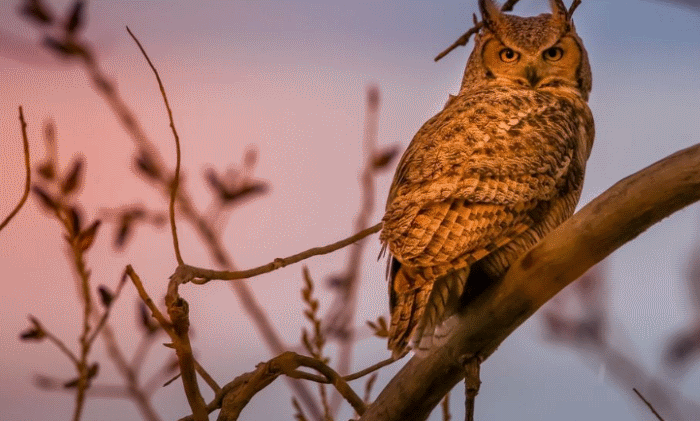 The great horned owl’s diet is probably as diverse as its habitat. Over time the owl has evolved to occupy its ecological niche by expanding the food base. Thanks to the great horned owl’s exceptional hunting skills and super strength, anything that moves in the darkness any animal at all, becomes the prey of the heaviest owl in Central America. It will hunt any animal that moves, walks, flies, runs, or even crawls on the forest floor. This indeed shows that great horned owls are the most opportunistic of the owl species. It’s probably time to discuss what actually great horned owls eat in the wild. The reproduction, nesting success and the mortality rate of a great horned owl is strongly linked to the availability of food in its habitat. When the prey is abundant the female lays large number of eggs in a single clutch and the owlets likely live a healthy life. During food shortage many females will probably do not nest so the weak baby owls emerge. At times, great horned owls starve for as long as a weak or ten days. Generally however great horned owls will need at least 50 to 100 grams of food just about every day. How Do Great Horned Owls Hunt? During winter when the prey goes short the great horned owl will probably begin feeding on carcass. But they are most likely to prefer live animals even in extreme circumstances. However large their eyes may appear to be, great horned owls will always make a silent flight to hunt small animals. Furthermore, the unusually large eyes provide the bird with a remarkable binocular vision at night although they can barely move their eyes for the same is set in a bony socket. Nonetheless, they can turn their heads 180 degrees to look behind while their body remains motionless. Not only do they possess excellent vision great horned owls have acute hearing sense too. The owl’s ears are hidden underneath its feather tufts. Many people think of these tufts as ears perhaps wrongly. As owls tend to be nocturnal, the outstanding hearing sense help them to search prey on the forest floor even in a moonless night. As the prey moves, so as the owl’s head to pinpoint the precise source of the sound. The facial disc enables it to detect the prey. 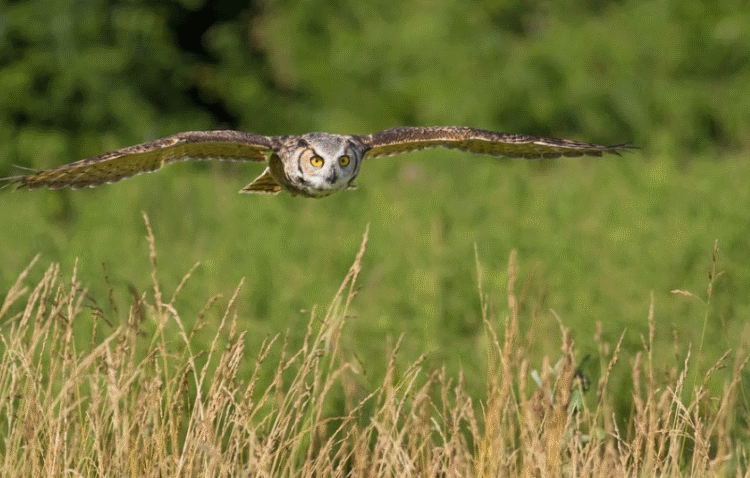 The owl makes a pretty powerful flight to follow the sound of its prey. When the bird gets nearer to its prey it extends its foot and open the talons only seconds before the contact. How Do Great Horned Owls Eat? Much of the great horned owl’s prey essentially consists of small animals let alone rodents. They will typically swallow the entire prey if the animal is small. The head is swallowed first followed the body and tail. Sometimes however if the bones are bigger the owl will crush them before finally eating. If the food is abundant the owl likely decapitates the prey like a praying mantis and eats only the brainy portion. They do this far too easily using its powerful talons and bill. The owl is most likely to take on egrets, herons, and shorebirds in open water habitats such as ponds and lakes. Great horned owls also hunt near human settlements including canals, woodlands, meadows, and agricultural crops. They do not fancy hunting in dense woodlands although their wings aren’t as big as their closest relatives. Great horned owls are not ambush hunters. They employ sit-and-wait methods to search for the prey whilst perching on a tree branch. If it feels a slight movement of its prey the great horned owl launches 100-yard short flight to land directly on its prey. They even walk around the bush to search for the prey if the same is missed in the first place. But it’s probably too rare to occur. Their awkward walk allows them to hunt small invertebrates including grasshoppers, mantids, scorpions, tarantula, and long-nosed snakes. They can even take on flying insects during flight especially grasshoppers, flycatchers, and beetles. Although quite rare, great horned owls have also been observed hovering a few meters above the grassy plains. It is however not so easy for a big bird such as this to hover around because unlike red-tailed hawk owls are just too big to beat their wings. Compared to other owls, great horned owls have the most diverse diet. They will also hunt greatest number of diurnal birds. More so, they attack just about any animal no matter how small it is. The great horned owl’s diet ranges from a tiny grasshopper to a medium sized ground dwelling mammal. Mammals are the most preferred prey for great horned owls. About 90% of owl’s diet essentially consists of mammals. Prominent among mammals are chipmunks, gophers, ground squirrels, pocket mice, rats, muskrats, wood rats, prairie dogs, marmots, porcupines, and raccoons. Depending on the location, great horned owls have varied diet. For those inhabiting Latin America, the majority of owl’s diet consists of marsupials and rabbits. They aren’t even scared to take on porcupines although can hurt them sometimes. Nonetheless, during nesting season when the prey density decreases the great horned owl relies heavily on birds. For instance, the owl actively eats grouse, pheasants, pigeons, starlings, or crows. Young owls will consume wrens, thrushes, ravens, doves, cardinals, margansers, grebes, loons, and songbirds. When Do Great Horned Owls Hunt? The great horned owl is known to be an exclusively nocturnal hunter but it does come out during the first light of the day as well as at dusk. A few of the owl’s prey such as lizards are highly diurnal therefore owls do become active anytime during the day. During nesting season when there are baby owls and the food is scarce, the great horned owl probably becomes active at morning as well as before noon. Fitch, H. S. (1947). Predation by owls in the Sierran foothills of California. Condor, 137-151. Rohner, C. 1995. 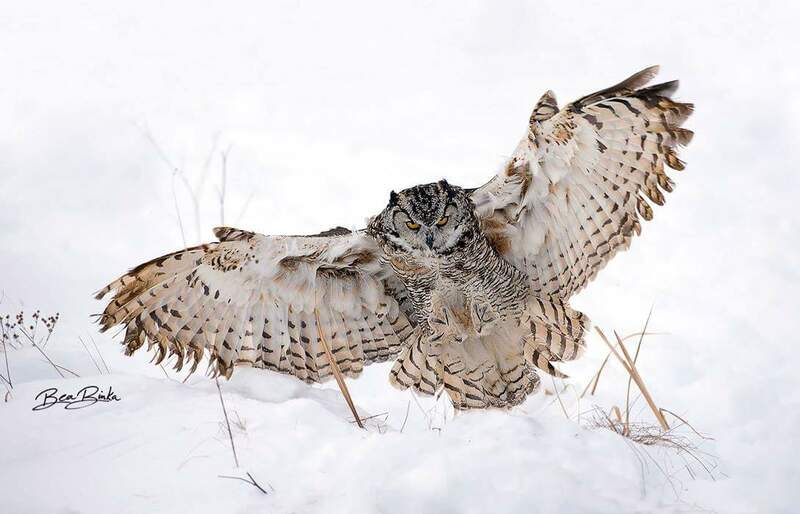 Great Horned Owls and snowshoe hares: what causes the time lag in the numerical response of predators to cyclic prey? Oikos 74:61-68. Marti, C. D. (1969). Some comparisons of the feeding ecology of four owls in north-central Colorado. The Southwestern Naturalist, 163-170. Cromrich, L. A., Holt, D. W., & Leasure, S. M. (2002). Trophic niche of North American great horned owls. Journal of Raptor Research, 36(1), 58-65. Storm, G. L., Andrews, R. D., Phillips, R. L., Bishop, R. A., Siniff, D. B., & Tester, J. R. (1976). Morphology, reproduction, dispersal, and mortality of midwestern red fox populations. Wildlife Monographs, 3-82. Ray, J.D. (2012). Great Silent Hunter. Birdwatching Magazine, Braintree, Massachusetts. Smith, Dwight G. (2002). Great Horned Owl (1st ed.). Mechanicsburg, PA: Stackpole Books. pp. 33; 80–81. ISBN 0811726894. 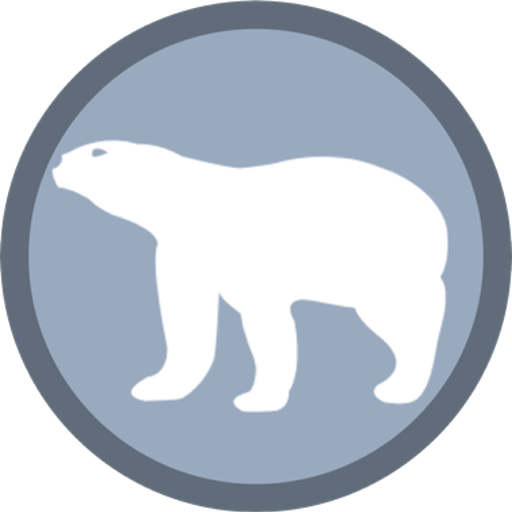 Retrieved 2013-03-21. Craighead, J. J. and F. C. Craighead, Jr. 1956. Hawks, owls and wildlife. Stackpole Co. Harrisburg, PA.
Keith, L. B. and D. H. Rusch. 1988. Predation’s role in the cyclic fluctuations of Ruffed Grouse. Proceeding International Congress of Ornithology, 19:699-732.